The late author and magazine publisher William Feather once said, "Books open your mind, broaden your mind, and strengthen you as nothing else can." That statement holds true whether you read a novel, a history book, or a software textbook. If you are a student, professional, manager, or executive interested in GIS technology, the five books below, published by Esri, will give you a new perspective on how maps, apps, the web, and imagery impact decision-making in many types of organizations worldwide. Authored by Dr. Tom Koch, this book traces the long history of how maps have been used to help unlock the mysteries behind the cause and spread of diseases such as the Ebola virus, AIDS, sandfly fever, yellow fever, and cholera. Cartographies of Disease: Maps, Mapping, and Medicine offers a nontechnical narrative and a visual history of mapping's role in studying what causes disease, understanding where and how diseases spread, and explaining how they can be combated. The illustrations include more than 100 maps and charts, ranging from a pair of 1694 paper maps of plague locations and containment zones in Bari, Italy, to digital maps of the 2014 Ebola outbreak in West Africa that were created using GIS technology. It's a must-read for policy makers and others working in public health and medicine. 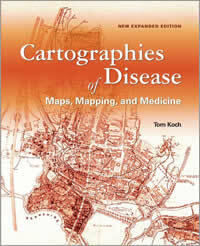 In this expanded edition, Koch includes new material to deepen readers' understanding of medical mapping spanning from the seventeenth to the twenty-first centuries, with an emphasis on cholera mapping made famous by Dr. John Snow's investigations in London, England, in the 1850s. However, Koch updates the book with two chapters on Ebola. Chapter 13 includes examples of media maps that overemphasized the threat of the spread of the virus globally. Those fears proved to be unfounded. "The panic engendered by the early fear mapping turned out to be just that—panic," Koch wrote. Chapter 14 focuses, in part, on how maps can be used to identify communities at risk for diseases such as Ebola, based on factors such as people's travel patterns. The maps can then be used to help develop programs that direct medical assistance where it's needed and to educate people about diseases. "Cartographies of Disease is a book about our confrontations with bacterial and viral agents across history," Koch writes in the book's introduction. "Ebola in 2014 reminded us that it's urgent to understand the conditions that promote disease and the ways we confront them on the ground." Esri president Jack Dangermond has called Map Use: Reading, Analysis, Interpretation "a comprehensive primer for using maps effectively." The 650-page textbook teaches map fundamentals—what maps are; the types available; what they portray; the purposes they serve; and how to read, analyze, and interpret them. A chapter on map design basics has been added to deepen readers' understanding of what goes into making a well-crafted map. "If you understand how a map is made, you will better understand how to use it," said Aileen R. Buckley, a research cartographer at Esri. She is a coauthor of the book along with A. Jon Kimerling, professor emeritus of geosciences at Oregon State University in Corvallis, Oregon; Phillip C. Muehrcke, professor emeritus of geography at the University of Wisconsin, Madison; and Juliana O. Muehrcke, founding editor of the journal Nonprofit World. While written mainly for students enrolled in college-level cartography or map use courses, the book also serves as an excellent resource for cartographers and professionals who work with GIS technology, remote sensing, and imagery. People who use maps for scientific research, navigation, and recreation will also find Map Use to be a perfect go-to reference. "A lot of people work with maps every day, but they don't necessarily know how to use them in as rich a way that they can be used," Buckley said. "Reading a map is probably the most common use of maps. You look at a map, you read the content off it, and you learn something new. But maps can also be analyzed. You can make measurements and calculate statistics using information that's on maps." Today, that analysis is often done using GIS. "While the focus in past editions was on using paper maps to do analysis, this edition focuses on mapping information using digital analysis, primarily through GIS," Buckley said. 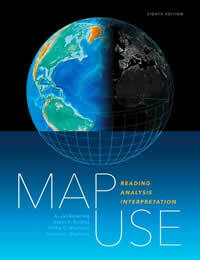 Illustrated with nearly 600 full-color maps, photographs, and graphics, Map Use has been updated to reflect the latest mapping technology, techniques, and terminology. The book is divided into three major sections: "Map Reading," "Map Analysis," and "Map Interpretation". Chapters cover topics such as the earth and earth coordinates, map scale and projections, spatial features, relief portrayal, and spatial feature and pattern analysis. A new chapter on map design basics explains how to define the map's audience and theme, craft a clear and concise message, choose the right map projection, use proper symbolization, make the map legible, use color effectively, and design maps for the web. The book includes a 44-page glossary that reflects the latest terminology in mapping, cartography, spatial analysis, imaging, land surveying, instrumentation, and the mapping community. There's high demand for GIS apps designed for use on the web and mobile devices, fueling the need for people trained to build and deploy Web GIS apps. Getting to Know Web GIS, by Pinde Fu, will give people of all skill levels the knowledge to build an array of Web GIS apps using the latest ArcGIS technology. Once built and shared online—often in a short amount of time,—these apps deliver authoritative maps, analytics, and other geographic information to the public, colleagues, and decision-makers. "Web GIS makes GIS accessible to everyone," said Fu, a senior GIS application developer at Esri and an adjunct faculty member at Harvard University Extension School and the University of Redlands. Readers will learn how to quickly make Web GIS apps using configurable app templates in ArcGIS Online; apply the ArcGIS Online cloud-based analytics and smart mapping capabilities to create informative, meaningful, and beautiful maps; build 3D scenes within apps; create Esri Story Maps apps, and much more. GIS is undergoing democratization online. Professionals who have little or no GIS experience can now—with some training—create, view, use, contribute, and share geographic information using Web GIS apps. It's no longer necessary to be an accomplished developer to build Web GIS apps, as the configurable templates that ArcGIS offers require zero programming, and other types of apps can be built with minimal programming. "Web GIS has unlocked the power of GIS," Fu said. The workbook tutorials have been updated to work with the latest releases of ArcGIS Online and other Esri products. Sample data for the latest workbook is available on the Esri Press Book Resources web page. 4. 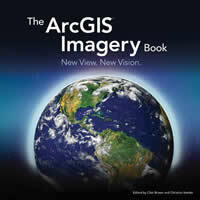 The ArcGIS Imagery Book: New View. New Vision. Getting a more intelligent picture of our planet just got easier, thanks to an explosion in new imagery data collection sources, like drones and microsatellites, coupled with new image processing and analysis capabilities in Esri technology. This next generation of imagery intelligence comes alive in The ArcGIS Imagery Book: New View. New Vision. It's available in print or via an interactive PDF, together with an interactive companion website, giving readers foundational knowledge about how imagery and remote sensing can be used with GIS technology. Readers also will get hands-on experience in working with imagery and remote-sensing data in ArcGIS, Esri's GIS platform. The ArcGIS Imagery Book provides an interactive learning experience. "It comes with intelligent information items: maps, web scenes, analytic models, story maps—just amazing rich content," said Clint Brown, the book's coauthor and director of product engineering at Esri. "We get into real-world problem solving and real-world applications." The book takes a look back at the history and rapid evolution of earth observation technology. For example, readers will see a panoramic photograph—taken from a kite in 1906—of earthquake damage in San Francisco, California; learn about the military's use of aerial photography for reconnaissance during World War I, World War II, and the Cold War; and view imagery, taken from a spacecraft, of the Earth, other planets, and moons. Readers will also learn about modern earth imaging technologies and how imagery data can be used in a GIS for applications such as precision agriculture, forestry, mining, humanitarian aid, urban planning, natural disaster assessment, and climate and weather studies. Readers will learn about new capabilities in ArcGIS, including ArcGIS Pro and Drone2Map for ArcGIS, for quickly processing, visualizing, analyzing, managing, and sharing imagery. After downloading the software via the companion website or the interactive PDF edition, Readers will also get a bird's-eye view of how the technology works as they begin to explore and study imagery and take lessons in how to work with imagery content within ArcGIS. "GIS is changing and in some really big ways," Brown said. "For a long time, imagery and GIS were thought to be separate. They were separate, not because they weren't both geospatial technologies. It's just that the computing environments in which they ran weren't capable of supporting both imagery and GIS." Brown said that the book shows what can be accomplished today, thanks to advances in ArcGIS, imagery, remote sensing, and cloud computing. "ArcGIS has become a full, completely functional image processing system in addition to being a GIS," Brown said. "The other big trend that is happening is just massive sensing of the planet. Everybody is a sensor now with their phones, but there are a lot of satellites and drones. There are all kinds of data being collected and placed into this GIS of the world. Access to this broad set of information has never been possible before, and now it is." The ArcGIS Imagery Book and its companion website—with 200 links to maps and other materials—include maps and apps to visualize and study imagery. You can tackle Learn ArcGIS lessons on topics such as imagery interpretation and analysis in ArcGIS in 3D and 4D, watch videos about GIS and imagery, and peruse thought leadership pieces about ArcGIS and imagery. Instructional Guide for The ArcGIS Book is a companion to Esri's The ArcGIS Book: 10 Big Ideas about Applying Geography to Your World. 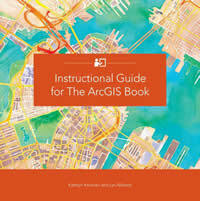 Written by GIS instructors Kathryn Keranen and Lyn Malone, Instructional Guide for The ArcGIS Book includes relatable activities and lessons that correspond to each chapter of The ArcGIS Book. GIS students and seasoned pros alike can hone their GIS skills while they build and publish web map apps; use live data feeds in apps; communicate information using maps; create and share Esri Story Maps apps, including the new Esri Story Map Crowdsource; answer complex questions using web maps and analysis tools; and make 3D map presentations. Some lessons require no software at all, while others call for using ArcGIS Online or Esri's cloud-based GIS apps such as Survey123 for ArcGIS, Explorer for ArcGIS, and Collector for ArcGIS. Readers will work through dozens of interesting scenarios. They will get to create an Esri Story Maps app that promotes a play in Washington, DC; study earthquakes using the QuakeFeed Earthquake app; and map tree data with Collector for ArcGIS. Whether you are a self-taught learner, currently teaching, or planning to teach GIS, Instructional Guide for The ArcGIS Book provides the materials to explore and apply GIS concepts and ArcGIS tools. "Each chapter includes activities and lessons designed to take the mystery out of using [GIS] software and web technology to solve real-world problems," Keranen and Malone wrote in the book's introduction. The guide includes other interesting assignments ranging from producing a map showing the location of farmers' markets to analyzing and mapping crime patterns and trends in an American city. You can purchase the print editions of Esri books from online retailers worldwide or by calling 1-800-447-9778. The e-book edition is available for purchase from online retailers. Outside the United States, visit esri.com/esripressorders for complete ordering options, or contact your local Esri distributor. 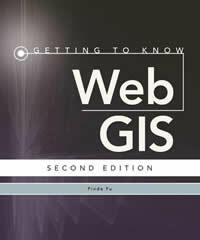 Interested retailers can contact Esri Press book distributor Ingram Publisher Services.